Let me take you on a walk around Bayou Bonfouca, a placid body of water that runs through Slidell, Louisiana. 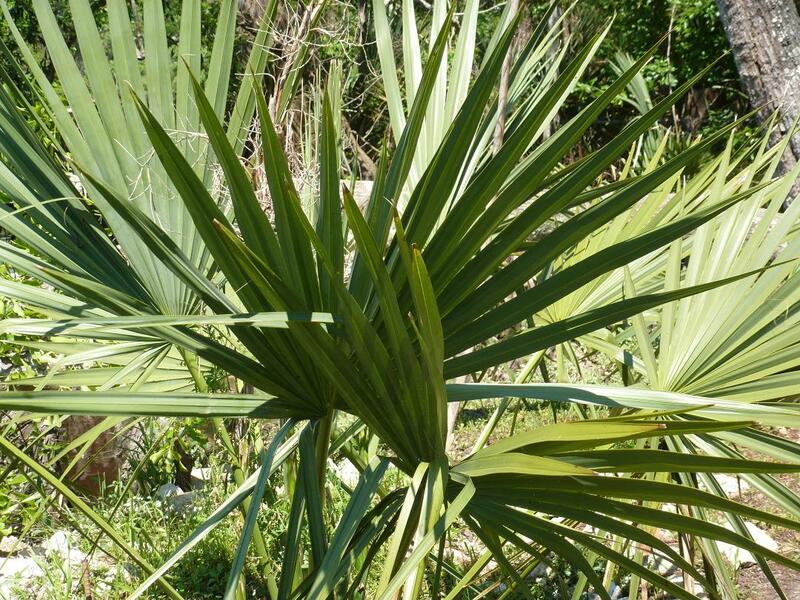 The palmetto is one of my favorite plants in Louisiana because it abounds in the swampy South. 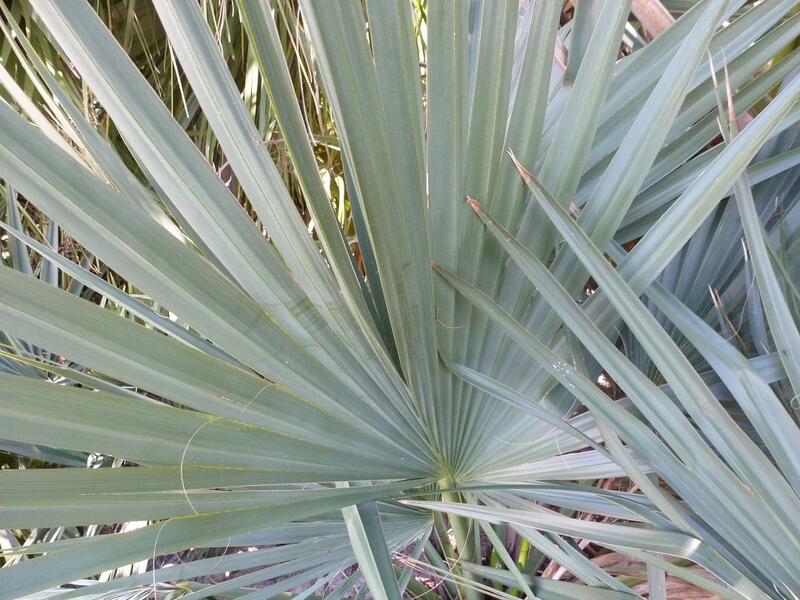 Though it resembles a Chinese fan palm, it doesn’t have spikes on the trunk. It also continues to grow fronds from the base of the plant, keeping it lush and green no matter how tall it gets. 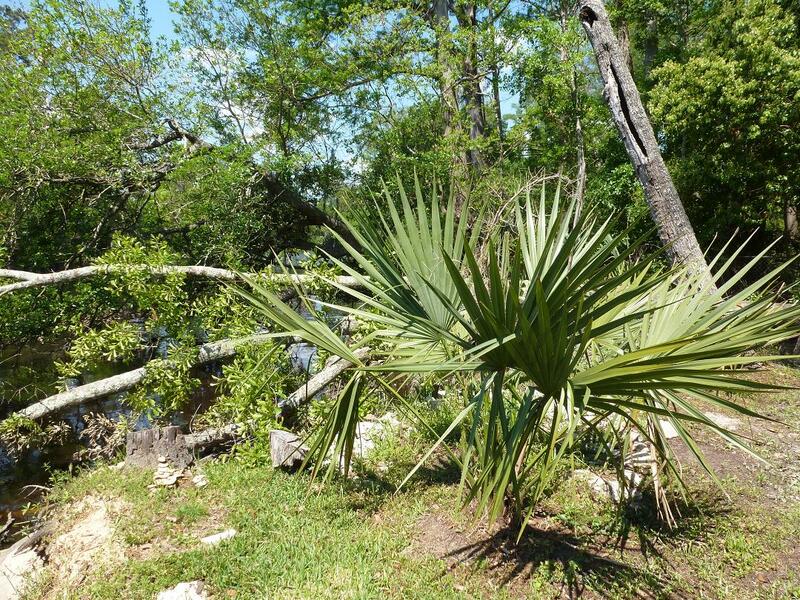 Palmettos are the prettiest palm tree, in my opinion. 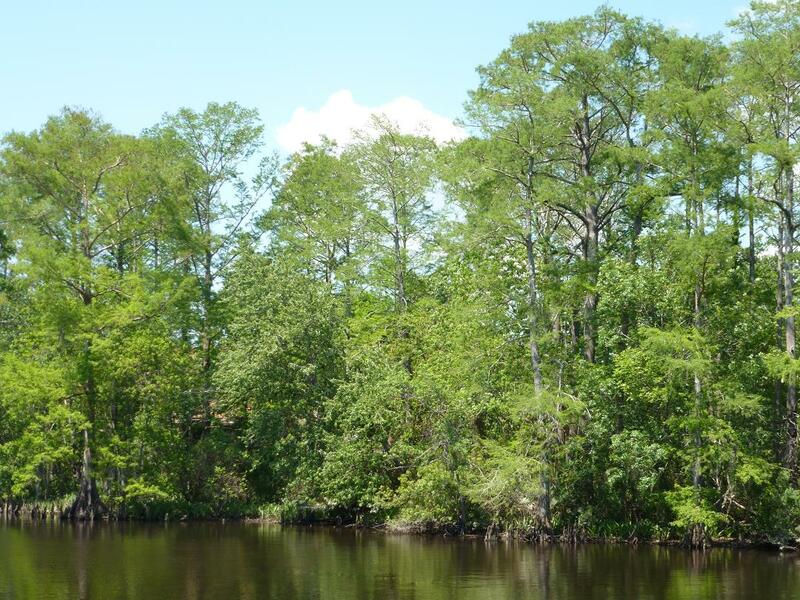 Look around the bayou at all of those magnificent trees! 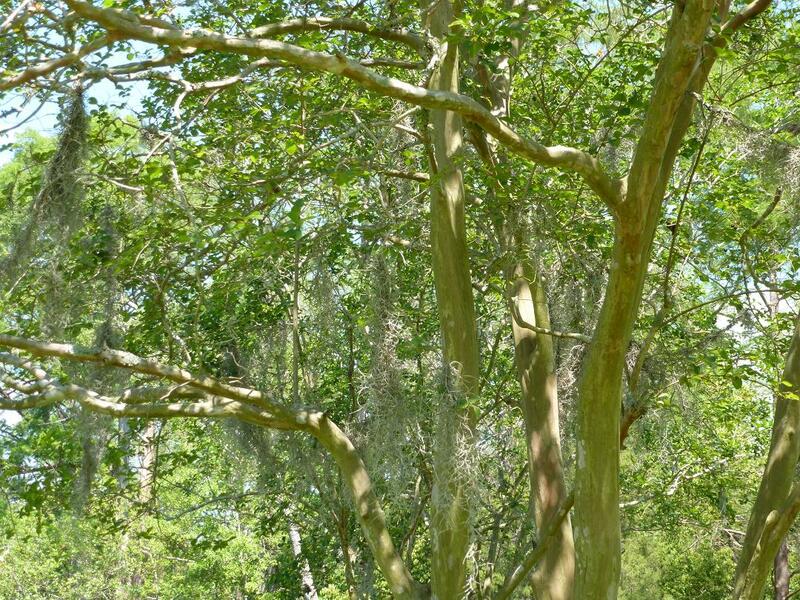 From this bank I can identify wax myrtles, bald cypresses, and pin oaks, to name a few. 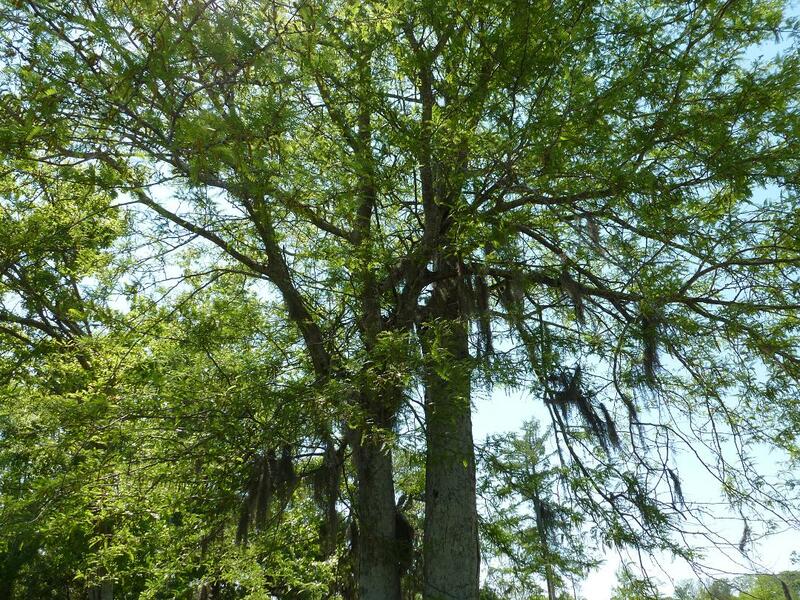 The bald cypress is the Louisiana state tree – our symbol. 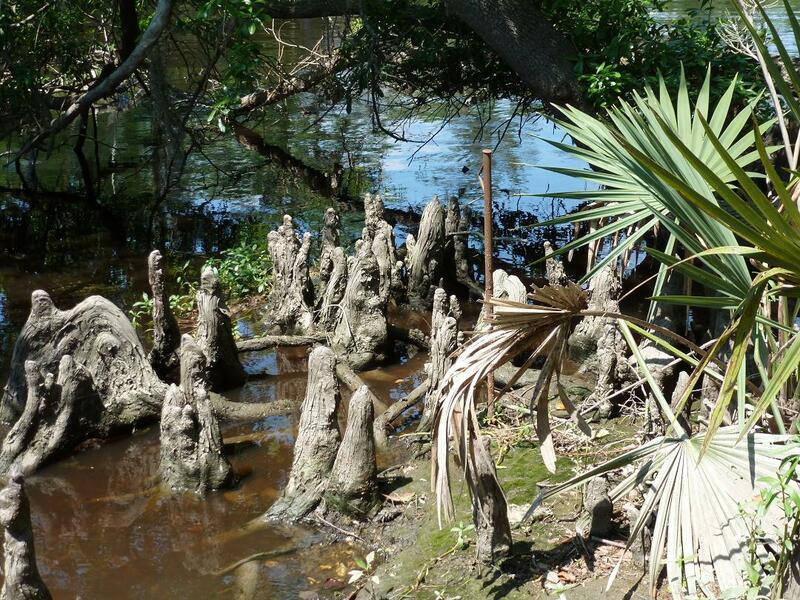 it produces these positively magnificent aerial roots or “knees” above the waterline. I love them; yes I do. Apparently the little palmetto over there does too! If I were a palmetto, that’s where I would be. One day I’ll show you what the swamp looks like in winter with all of the bare cypress trees. Heaven, that’s what a swamp is in winter. 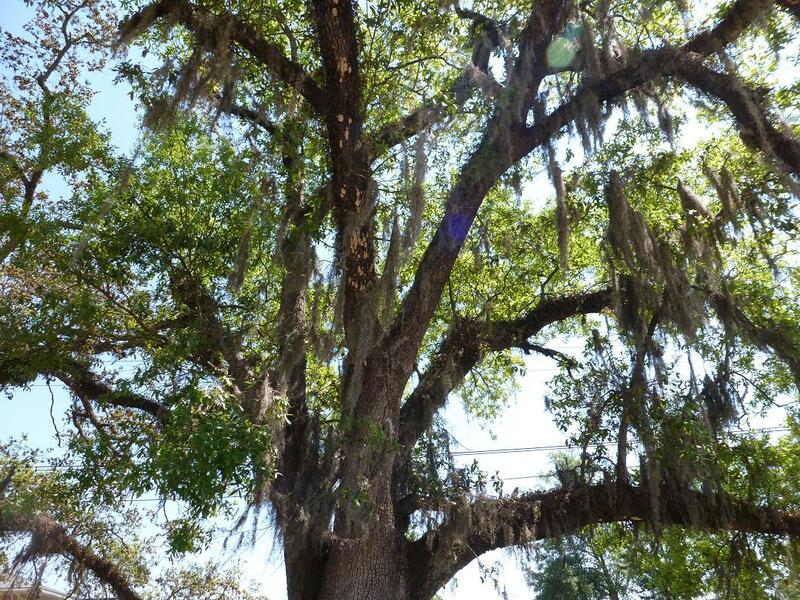 This is probably the tree most people picture when they think of “The South” – a live oak draped in Spanish moss. 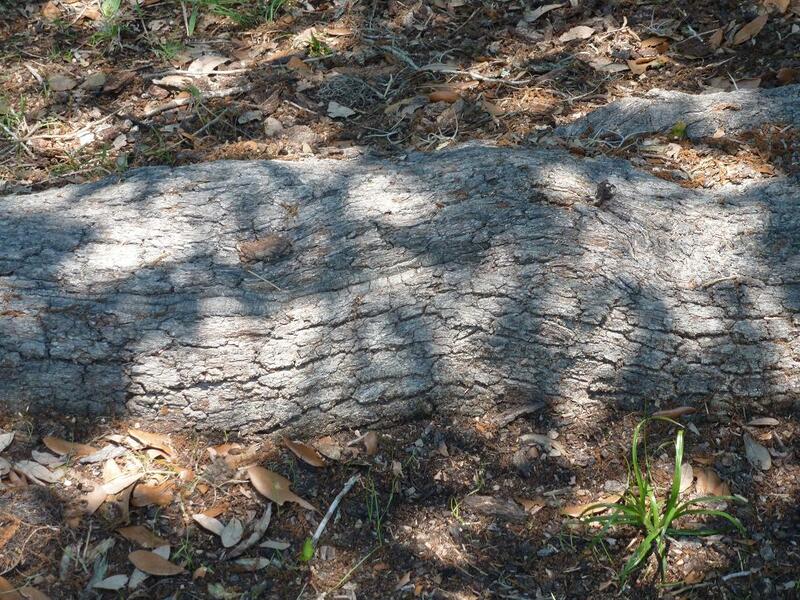 The oak tree’s root takes me back to when my sisters and I were little. We used to hop from one root to the other to see how long we could avoid touching the ground. Oak trees make great playhouses. 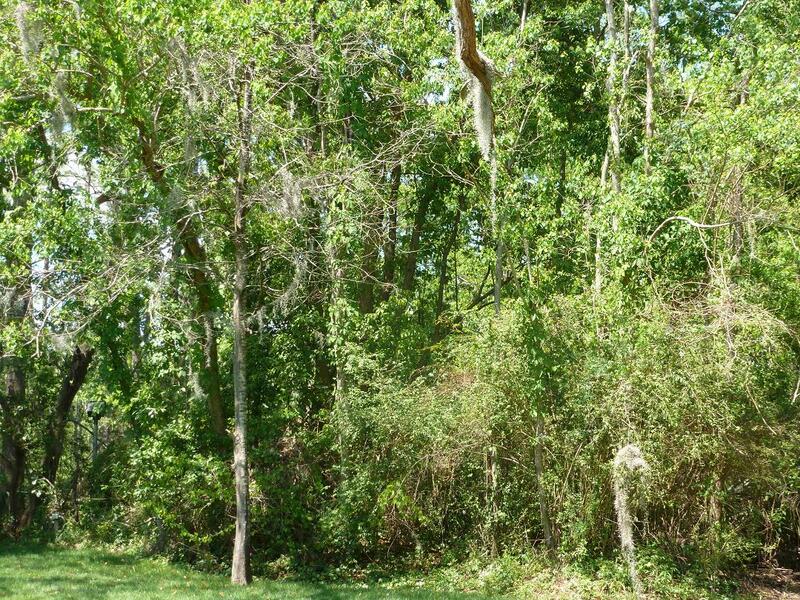 Isn’t this tangled mess of trees enchanting? I’d wander in there an poke around a bit – see what I could see. June is a little late for blackberries, but you never know. where light is only allowed in intermittently. A breeze blows down there as well, even though it’s a hot breeze. Here is one more oak tree – I just couldn’t resist shoving my camera in all that greenery to get a closer look. I think Kermit was wrong – it is so easy being green. At least, it is when you belong to the beauty that is a Louisiana bayou. 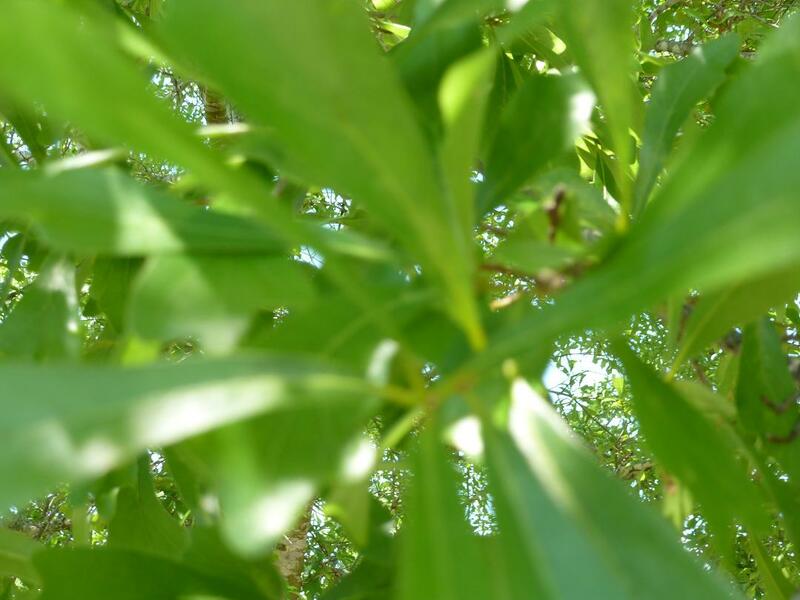 The trees are beautiful, especially the lushness of it all. 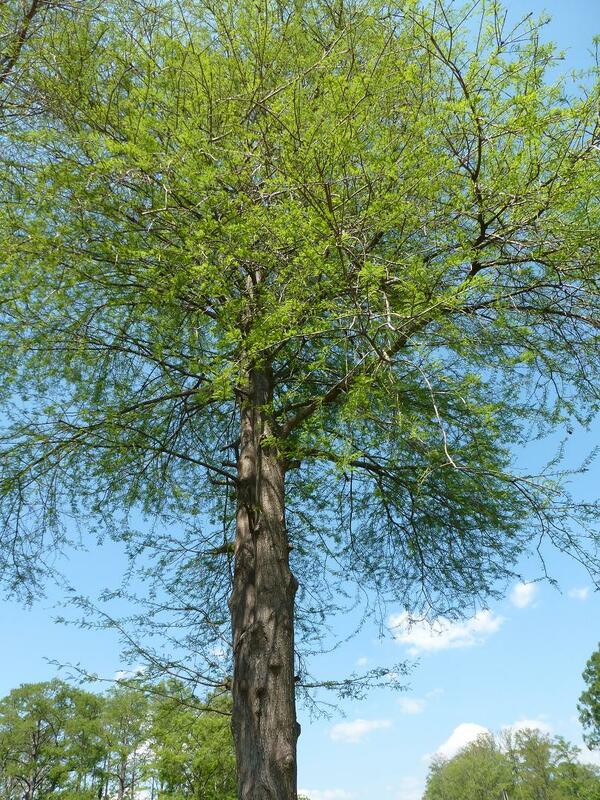 I do like the little palm and the roots on the bald Cypress are amazing. I can imagine that it is a very nice place to be in the heat of summer. When I went to New Orleans we drove around and visited the swamps. We saw beautiful white birds, I think they were egrets, but I am not sure, wading in the swamp. Yes, I believe the bird you’re referring to is an egret. I love them – so graceful in an awkward sort of way, if that makes sense! While I’ve been to the Florida mangroves, I haven’t made it to the bayou yet. Beautiful – the description and the pics.